Deck was always the unsung lyrical hero of the Wu, the wordsmith who had the rough luck to be in the same group with a gaggle of dope MCs. With a voice that wasn't as distinct as Method Man, Ghostface, or Raekwon, it seemed he sometimes got lost in the shuffle for casual listeners. But attentive Wu-Tang fans knew that The Rebel INS was more than capable of holding his own, and we were all a little disappointed that his solo album wasn't included the "first wave" of the Wu solo records. Of course, this also served to give us time to build up the prospects of his solo debut in our heads. By the time it came out, we had convinced ourselves that it was going to blow the rap game wide open. It didn't, and at the time I remember feeling a bit underwhelmed by the album (we had definitely expected too much), but it, like many turn-of-the-century Wu releases, has aged really well. I don't know if it's the benefit of looking back on it almost a decade later, but this record shines with a lot of the vibe that is often found in Classic Wu material. The beats aren't always as punchy (and a lot of them suffer a bit from being too repetitive), but Deck makes 'em work. I wanted him to barrel through and bowl everyone over with verses like his untouchable lines on "Hellz Wind Staff" from Wu-Tang Forever, but he keeps a lot of this record laid back. But joints like "R.E.C. Room" and "The Grand Prix" move well. And Deck keeps his guest spots in check, calling on Masta Killa, U-God, Streetlife, and some of the other more peripheral Wu dudes. This makes "9th Chamber" one of the strongest songs on the set, featuring verses from some Wu-affiliates that aren't often seen all in one spot. While the album does slow a bit in spots, Deck knows how to keep it movin', and his lyrics are, for the most part, top-notch here. A few things don't quite gel: the intro is long and pointless, and that cover has always rubbed me the wrong way. Dumb concept, terrible graphics, and a lame reveal on the back that shows that the cops are chasing him because he's got a copy of Wu-Tang Forever stashed in his pocket. 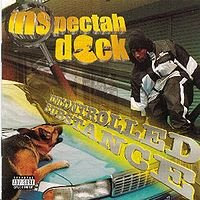 I don't have the other Inspectah Deck solo albums, but I'm working on it. And is he calling himself "Da Bill Collectah" now? Because that is idiocy. Man, I have always really loved this record. I agree with you that it is a tad too long as it seems to drag towards the end ("Trouble Man" and "Hyperdermix" are not innovative by any means). That being said this is a solid album with no songs that make you head for the skip button, something that can't be said for all 2nd wave Wu releases (I think TIcal 2 has 47 tracks?). I loved the choice in guest spots as he pulls together some of the best 2nd-tier Wu guys from the era. "9th Chamber" is simply thunderous. Although the album is not instantly catchy I have always felt that this was to its benefit as it can be listened to repeatedly without getting old. "Longetivity" and "Friction" sound like they are straight off of Wu-Tang Forever" and "Elevation" is an oddly sweet song. As you said, "The Grand Prix" and "R.E.C. Room" really give him the opportunity to show his quick delivery. All in all this is a better album than I think people remember. As for his later albums, "The Movement" is decent at best but offers nothing worth bragging about. It sounds nothing like a Wu-Tang album. Instead it sounds like a guy from New York trying to make a standard New York (read: boring repetitive beats) album, which doesn't really fit his style. Deck also comes off like he is purposely dumbing himself down which is disappointing. "The Resident Patient," while not brilliant, is definitely a step up from "The Movement." This one has some some clunkers but also has some great ones, proving that Deck still has it. As for Da Bill Collectah, I have no idea. I know he was calling himself "Manny Festo" for awhile which is extremely idiotic. Whatever happened to Rollie Fingers?